Debt collection is an important part of the proper functioning of any business. Having a strict “payment up front” policy may hurt efforts to expand your business, as many potential customers may need to purchase your products or services on credit. However, it is essential to be able to stay organized and keep track of who owes you money, how much they owe you, and when the debts are due. This app allows you to record your debts. You can record the name of the person that owes you the debt, the date that the debt was made, and how much money they owe you. If the debtor also has an iPhone and has the app installed, the record of the debt can be sent to his device to help him remember that the debt that he has incurred. 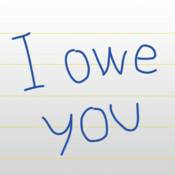 This is another app that allows you to record debts that you are owed. It has a number of different features. You can classify each debt you record by category, to help you more easily remember how the debt came about. You can also associate a photograph with the debt. The app also allows you to add notes and due dates to help you stay organized and remember any special circumstances regarding the debt. With this app you can track debts using different currencies, recording such information as the debt amount, a description of the debt, and the location of the debt. It also features debt reminders. You can group debts by the person who owes them to you, sum the total of the debts, and more. Send text and email reminders, backup data stored in the app, set a password to keep the records of the debts you are owed private, and more using this app. It can even track the lending of physical items through the use of the app’s description field. This app includes features such as debt history, cloud sync, and debt sharing. There is also a pro version for $2.99 that supports additional features such as password protection, email and text reminders, and overdue debt notifications. Does your business have outstanding accounts you’re having trouble collecting? Contact the business debt collection attorneys at Berkowitz Klein LLC and get your business the payments you deserve. This entry was posted in Blog Posts on March 26, 2013 by Gerald S. Berkowitz.